After my tutorial on setting up Multiple Monitors on Windows Vista last year, a couple of you have written in asking for help with Windows 7. For the most part, it’s just as simple and more options are now available as well. My setup currently consists of a Dell XPS M1530 laptop connected to a Samsung SyncMaster 206BW. I’ve got a dual display setup, so I can drag windows between the two displays and utilize all the screen space. It’s quite easy and you can have it setup in minutes. For most, that should be about it. Just hit Apply and everything should be setup. But for instance say you have physically positioned your laptop and monitor above or below each other. You’ll have to make a few changes. Click Identify to figure out which monitor is which. Then drag the display icons into the proper position as they are located physically on your desk. If you would like the start menu to be located on a different display, click on the display you want and check the “Make this my main display” box. Hit Apply again and all should be working! Give it a shot, just try dragging a window from one display to another. If you have any questions or just want to say thanks, feel free to leave a comment! John, are you saying you have 4 monitors ruinning off one computer? I can’t even get a second monitor running off my Eee PC 1005. I could when I was running XP on my first (and much older) Eee PC, but in Windows 7 I now get a very different set of options when I select “Screen Resolution”. I can only choose to have the desktop appear on the laptop monitor, the external monitor, or both. Vista has the limitation that all video drivers must be from the same vendor. I have a quad monitor system that worked extremely well under XP, but would not work without a new card under Vista because the onboard was Intel and my card was ATI. Does Windows 7 have this same limitation? I need help with a dual monitor setup. A month ago I bought 2 ASUS VW246H monitors. Each has 1 HDMI, DVI, VGA input terminal. Then I bought an ASUS CS5111 desk top which has 1 HDMI, and 1 VGA terminal. If I connect one monitor to the VGA and the second to the HDMI terminal can I use this setup for dual view monitors? Please advise. Your article is helpful and very timely. If your computer’s video card supports output through both at the same time, yes it should work just fine! If it’s only a month old desktop, since it’s quite new it should probably work just fine. One thing to keep in mind is quality. The quality of VGA/HDMI is digital so it’s accurate representation of the output from your computer, so the quality will look damn good. However the VGA might not always match up as well. It might be slightly blurrier. If you have good eyes, you may notice that. But for the most part, it should work perfectly! Sahas Katta personally I am running a HP Pavillion dv9000 maxing my RAM to 4 Gigs I am driving a Samsung 23″ HDTV wanting to apply wing monitors and I am thinking of going to two (2) LG’s W2453VPF 24″ Widescreen LCD Monitor 24″ Widescreen LCD Monitor, HD Ready 1080p, 50,000:1 Digital Fine Contrast Ratio. 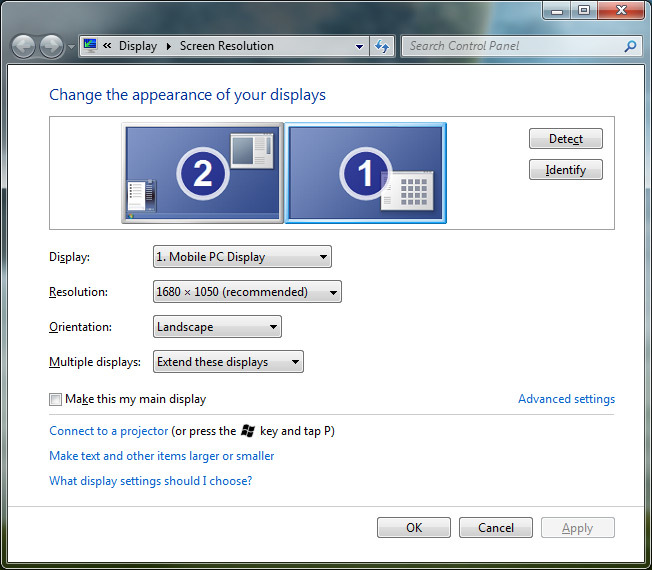 Since I have been told will actually match and use the screen resolution aspects for additional monitors 2, 3 and 4? My question since I can only drive with my HP xb3000 Notebook Expansion Base what options do I have to run the additional monitors Windows 7 is advertising or if I go back to a Desktop what specs does Windows 7 require for the additional 3rd and 4th monitors? Why so many monitors Social Networking, Free-Lance Writing, Blog under construction that I will be moving to Square Space soon. Just to much stuff I need to do that I am tired or doing on two Laptops. Doing multiple monitors has more to do with video cards than with RAM. You have a pretty media-eccentric laptop, but I don’t know if it will be able to do more than a total of two displays at a time. Most laptop video cards support outputting one display at a time. That means the laptop display + external display = dual displays. Usually not any more. The only way I’m aware to get more displays is with USB display adapters, which work, but not that great. I suggest calling up HP to ask how many monitors the laptop supports outputting at once! If you go back to a Desktop, it once again depends on video cards. You need to have possibly one or two video cards to support two or more displays. Windows 7 can support more than 2, it’s more of the right hardware that’s required. Richard, your problem is that your Video card is only a DX 8.1 supported, by XP(32 &64 bit) It isn’t support by either Vista or Windows 7. The only thing I can suggest is that you upgrade your Video card to a better DX 10 Workstation card. Consider any of the, 4x/8x Quadro, or a Matrox PCI. The newer FireGL workstation cards require PCI-E, which your Motherboard doesn’t have. You are limited in your choices by the Motherboard, in your Dell Precision Workstation. @John, I couldn’t have said it better! I want to keep my existing machine going longer, as it is still more than enough power for everything I do, and Windows 7 has speeded it up !! Your Welcome Richard @Sahas No Problem, I like being a member here. Learning all the new things you present, and helping out, when I can. Video Card. I picked out an 8x AGP card which is known to work in Dell Precision Workstation 350-370 Models. All AGP cards are backwards compatible, so the 8x will work at 4x in your PC, but it will be MUCH faster! [he has the 350], and I helped him upgrade, with these exact parts. (which is mostly free)Plus, great prices, which are hard to beat. The PSU has the 6 prong power dongle you’ll need for the Video card! Once you get the parts, I can help you install them. With step by step instructions. Again the total will be minus $10 with the mail-in rebate. Save the Box from the Video card. normally they require the Bar Code and a receipt as Proof of purchase! I’m running windows seven and have a brand new computer. So i bought a small tv i would like to use as a second monitor so i bought the cables to do so but when i got it im only getting a mirrored image of the first monitor. how do i actually split the monitors rather than copying the image on the second one? Did you read the article? That’s what it’s about. 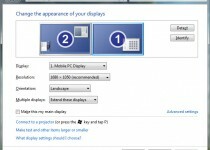 As the article states, set it so that the monitor that you use the most is the main display. Check that box in the Display Settings. And that should do the trick. If you need to re-arrange their physical positions, just drag the monitors around on the settings page. I see, yes there is a difference between £ and $ but you seemed to have worked it out. While they(ATI) do recommend a more powerful PSU, I’ve seen many work with the Stock Dell PSU, like yours did. Just keep an eye on that part(PSU) in the future, although I doubt you’ll have issues. Okey my turn. Lets see if you guys can fix this one. Im running Windows 7 on my Amilo M3438G from the stoneage, with custom drivers as i even had when running Win XP. But now my brand new 50″ plasma doesnt get any signal from my computer. The GPU is a Geforce 6800Go. And the computer is running very nice and stable and gaming is no problem. In NV Control Panel i cant choose Multiple displays at all, the option doesnt exist. If i try to enable it in windows i see my TV and i choose clone as usual and hit “Apply”, it tells me “Unable to save displaysetting”. This annoys me. Is the problem in my modded drivers, maby the modded .inf? If it’s a 50″ plasma, you are probably using HDMI? If that’s the case it might not be working since it might require HDCP encryption. I don’t know which custom drivers you are using. There’s a million of them out there. The latest NVIDIA ones from their website have been fairly reliable. If you install those, it usually includes the Control Panel for Multiple Monitors in the Advance View. Centrino 2Ghz Pentium(760)-M CPU 2GB’s of Memory & a 256MB 6800go GPU and RAID0/1 capable isn’t considered Stonage[Yet!] I liked it alot when I first saw the specs in 05′ its a shame[for me] they sold them across the pond from me. I went with an XPS gen 2 notebook back then. hopefully it works with yours. Hehe okey.. Yes im using HDMI in my TV and with a DVI adapter to my notebook. It worked fine with Win XP. And the drivers on nvidia.com dont work with my notebook, they are custom made by the factory, which hasnt released new drivers since i dunno 2005 maby. So the only way is to run custom. Hmm i have tested out some more. When i choose the option “Connect to a projector” or something like that i get the signal on my TV! But when i do that my laptop screen turns black =(. Even if i choose clone or any other option. There gotta be a way to force dualscreen mode somewhere. Anyone? I belive there is a problem in nvtweak, a line missing or whatever. Anyone has an answer for that problem ? A problem of frequency ? ok so this is an odd one for me, im playing a game in full screen on my primary which usually gets reresoluted on a few it will change 2ndary’s resolution(lil odd) however my current problem comes from when i want to use 2nd it will minimize my game and will reresolute everything to my primary. my thoughts were that isn’t each monitor its own? so once set they shouldn’t change when only 1 is being effected. i have never seen this be an occurrence with dual monitoring even if i am new to 7. Hellow everyone, I’ve been useing windows7 since it came out and I have to say im loving it so far. I really did not find any problems with it untill i lost power at my house. When i turned the computer back on my display settings went back to there original settings. So I set it back to dual screens extended, put all my icons back where they I wanted them then restarted. Again back to one monitor, so I did all the steps checked all the setting checked all the drivers and nothing fixed it. I have 2 ATI Radeon HD 4870X2 Crossfired. This is a high end gaming machine 12 gigs of memory quad core processor. So i was thinking ati might not have drivers out yet that work right. Then i checked last night and they had new drivers so I updated the drivers restarted the computer down to one monitor again. So again i looked everywhere online for anyone with this problem no luck. I wanted to know if there was settings somewhere in windows7 im missing I have looked everywhere. Things can get wacky when you have a blackout/power surge. It may be a hardware issue. Take your cards to worstbuy and ask if they will test them. Is it possible to use 2 different pictures for each monitor? Yeah if you run dual monitors you can (if your computer can handle it) show a movie on one screen and do other things on the other one like play a game or something. Not much improvement on custom wallpapers. It’s pretty much how you had to do things when Vista was here. I wrote a quick article about it here. Ok everything seem crystal clear here, love it! Here is my problem, i have upgraded to win 7 and am operating duel monitors as we speak from my laptop. Here is the kicker, whatever i see on the laptop the hpw2007 is showing the same exact things? No obviosuly im say 50% there to run various pgrms on each screen but im stuck. What I have done, I have gone into the control panel, but ony its detecting 1 monitor, i have tried updating all my devises with updates and hall are current,,,what the heck am i missing? I am trying to use my Toshiba laptop as a second monitor. I have selected “Extend these displays” and can see the both monitor images and I can even change the resolution on both monitors. However, no matter what I do, clicking on “Identify” only identifies monitor #1 and I cannot get dual monitoring working. I have tried using setting the laptop as monitor #1 and my desktop as #2 and visa-versa. I get the same results every time. Windows 7 detects the second monitor, I extend the display, but it can’t identify anything other than monitor #1. I even tried connecting directly to the second port on my Radeon 4850 instead of my monitor and that didn’t work either. I also tried the function keys several times (fn + F5 and F9 on my computer) and have tried setting up dual monitoring from my video card settings on both of my computers as well as using the Windows settings like in this article. I am hoping someone else had this issue and could help me out or has a suggestion on what else to try. i’m trying to setup a vga supported monitor with a gateway laptop that originally had windows xp. should i blame it not working on windows 7 or on the video driver? I am new to Win7. Have a AGP Nvidia Geforce FX5500. Used to be able to have dual view when I was on XP – watch video on 42″ TV whilst still working on 19″ LCD monitor. Is this setting still available in Win 7?